R2’s are non-LTR retrotransposable elements that insert site specifically into the tandemly arrayed 28S genes of the rRNA gene loci of many arthropods. The 5′ end of the R2 element does not encode a promoter. Instead, R2 transcriptional regulation appears to be accomplished by whether ribosomal DNA units with R2 insertions are themselves transcribed. Element sequences are then processed from the 28S gene co-transcript by self-cleavage via an encoded ribozyme at the 5′ end of R2. 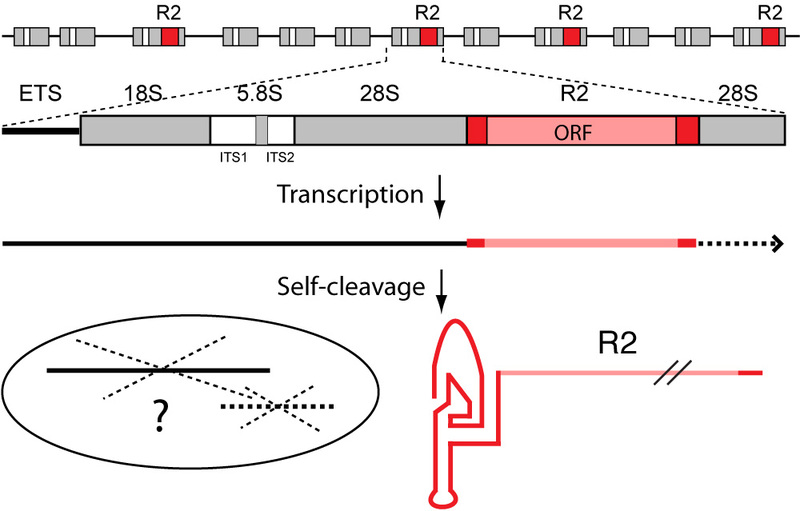 The rRNA sequences of the co-transcripts are believed to be degraded in order to maintain a balance between 18S and 28S ribosomal units in the cell. 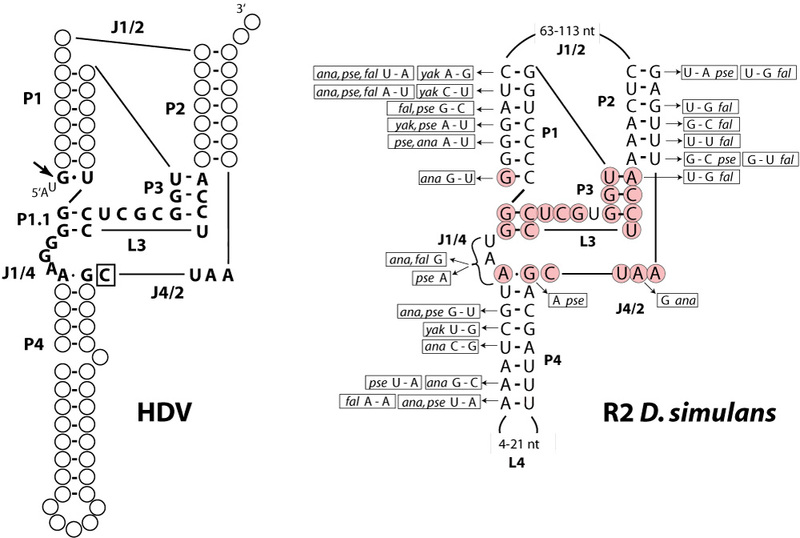 R2 RNA sequences from the 5′ end of the fruit fly D. simulans element fold into the same double pseudoknot structure determined for the Hepatitis Delta Virus (HDV) ribozyme (Ferre-D’Amare et al. Nature 1998; 395:576-574). Nucleotides in and around the putative active site that are in common with those of HDV are enclosed in pink circles. Consistent with the model that the sequences within the stems (P1, P2, P4) are not important, compensatory changes were found at most positions for the R2 ribozymes encoded by other fruit fly species (ana- D. ananassae; fal- D. falleni; pse- D. pseudoobscura; yak- D. yakuba). The exception is the ‘G’ residue at the base of P1 which is found in most HDV-like ribozymes. The major structural difference between the HDV and R2 ribozymes is the much longer length of the J1/2 loop in the fruit fly ribozymes.